NEGROMANCER 2.0: I Reads You Review - "DC COMICS PRESENTS: Batman"
That late Julius “Julie” Schwartz (1915-2004) was known for his long association with DC Comics, where he was a longtime editor and guiding force. For a time, he was the primary editor of DC Comics' flagship franchises, Superman and Batman. Schwartz was also one of the earliest science fiction literary agents (being a co-founder of Solar Sales Service, a literary agency) and was basically one of the founders of early science fiction fandom. DC Comics Presents: Batman featured two stories inspired by the cover of Batman #183, which was drawn by Carmine Infantino (pencils) and Joe Giella (inks). DC Comics Presents: Batman also sports a modern take on Batman #183's cover, as drawn by Adam Hughes. The first story is “Batman of Two Worlds” and is drawn by Infantino and Giella who drew the cover art for Batman #183. Written by Geoff Johns, the story finds Batman and Robin always bickering... until Batman kills Robin! No worries though, this Batman and Robin are fictional, the stars of a scripted television series based on the real Dynamic Duo. When the real Caped Crusaders start investigating this strange Bat-case, they find that everything is not what it seems. 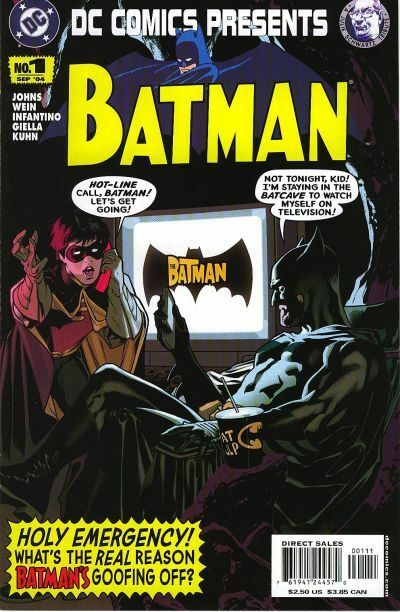 Then, writer Len Wein and artist Andy Kuhn take Batman to television again in “The Ratings War!” The hottest show in Gotham City is “The Real Adventures of Batman and Robin.” In fact, this reality series is about the real Dynamic Duo, because its cameras capture Batman and Robin live and in action across Gotham City. And this show has taken bottom-feeding television station WGTM to the top of the ratings heap. So how does WGTM know when and where Batman and Robin will be in action? DC Comics Presents: Batman made for pleasant reading. “Batman of Two Worlds” is the kind of simple, straight-forward story that would have fit right into almost any issue of 1960s era Batman or Detective Comics. 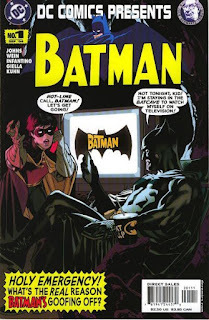 In fact, the 1960s where when Carmine Infantino (with inker Joe Giella) was producing what would be a hugely-influential run of Batman comic book cover and interior art for both Batman and Detective Comics. However, Gardner Fox wrote many of the stories drawn by Infantino, and disappointingly, Geoff John's “Batman of Two Worlds” is a mere shadow of Gardner Fox's imaginative Batman tales of the 1960s. Of the two stories, I prefer “The Ratings War!,” which I find truer to the spirit of Gardner Fox. Yet it has a timeless quality. The scenario for “The Rating War!” would be plausible (relatively speaking) in the 1960s. Obviously, this story probably makes more sense today, especially because the last three decades have seen countless reality TV series that follow “real-life” law enforcement on the job, in the courtroom, and behind the scenes. I could be cynical and say that this Julie Schwartz tribute is as much about selling comic books as it is about remembering a DC Comics luminary, and I'd be right. There is a reason that when DC released this back in 2004, it threw around the names of the fan-favorite comics creators that were contributing to this “tribute.” That reason is sales. Why did I buy the comic books that comprise this series? Well, I bought them because they are connected to Silver Age DC Comics. I will buy pastiches and tributes to Silver Age DC almost as quickly as I will buy actual reprints of Silver Age DC. And I like DC Comics Presents: Batman for what it reminds me of more than for what it actually is. Reviewed by Leroy Douressesaux a.k.a. "I Reads You"